My borrower visits in the past couple of weeks took me up to the northernmost regions of Zimbabwe, to the district of Binga, straddling the Zambezi River and the Zambian border. Binga is a six hour journey north of Bulawayo, a completely straight road with only one single junction (when you’ve got only one turn-off to look forward to in six hours, it’s amazing how exciting that event becomes…). The area is home to the Batonga people: Zimbabweans are predominantly from the Shona or Ndebele traditions, but the Batonga have a distinct history, language (Tonga) and culture (most famously, the old women are renowned for smoking clay water-pipes). Much of the region is very remote and the borrowers I met thought nothing of regularly walking 25-30km to reach the nearest public transport or shops. But the landscape is stunningly beautiful, with rolling green hills, hot springs and beautifully majestic baobab trees. Baobab have been described as ‘upside down’ trees: the trunks are enormous (there is apparently one in South Africa with a bar built inside). The fruit is slightly tart and, amongst other things, is used to make a delicious jam. ‘Beomusokwe’, an ancient baobab near Binga. They can live up to 1,000 years. The Batonga homesteads dotted around are unique: the bedrooms are raised off the ground, to allow air to circulate and keep the rooms cooler. The town of Binga is where the Zambezi starts to swell out to form Lake Kariba, one of the world’s largest man-made expanses of water created when the Kariba dam was constructed in the 1950s. I found it a slightly eerie image, seeing the tops of the original ’drowned trees’ still poking through the water, and having read that 17 workers swept up during the pouring of the concrete now form part of the dam wall. 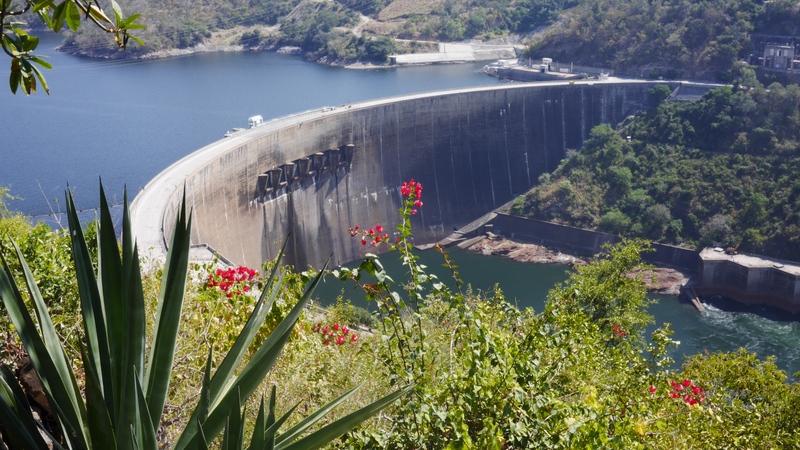 The dam provides a substantial proportion of the electricity for both Zimbabwe and Zambia. However, it resulted in the forced relocation of around 60,000 Batonga people from their ancestral lands. The local ‘Loch Ness Monster’ equivalent, Nyaminyami, is supposed to be pretty upset about it, especially since the dam separated him from his wife. He’s exacting revenge through the changing weather conditions and earthquakes since construction (others might argue there’s a more scientific reason for these, given the scale of the new lake). Either way, the resettlement to less fertile land caused significant hardship that people are still struggling to overcome. Apparently at the time, £1,000 was spent per animal rescued, against around £50 per Batongan. Things are still challenging: I was shocked to learn that, despite the enormous scale of the Binga district (we travelled for hours across dirt roads to visit the Kiva borrowers), there’s a total of 2 full time doctors here. ‘Survival of the fittest’, I was told, when I asked how people manage. Fish understandably forms the main diet, both bream from the river (which is often dried) and ‘kapenta’, a small, sardine like fish introduced into the lake some years ago and which is now hugely popular across all of Zimbabwe. Kapenta are caught by local fishermen, overnight, using bright spotlights shone into the water. Once a large shoal has been attracted, the light is switched off and they are trapped in a net placed below as they try to swim away. From the hills around, it made for some amazing views in the evening, the hundreds of spotlights dotted across the lake as the sun set. Kiva has been working in the area with Camfed over the past couple of years. I met several borrowers who had used their loans to establish kapenta or bream businesses, purchasing the fresh catch and then drying it in the sun. Once again, I was hugely inspired by their stories, and very moved to see how the Kiva loans, and the fantastic work that Camfed does, is transforming their lives. So I’ll finish this with some of the heartwarming smiles of Binga’s Kiva borrowers, their families, and their Camfed supporters. Next: Next post: Will they pay back?